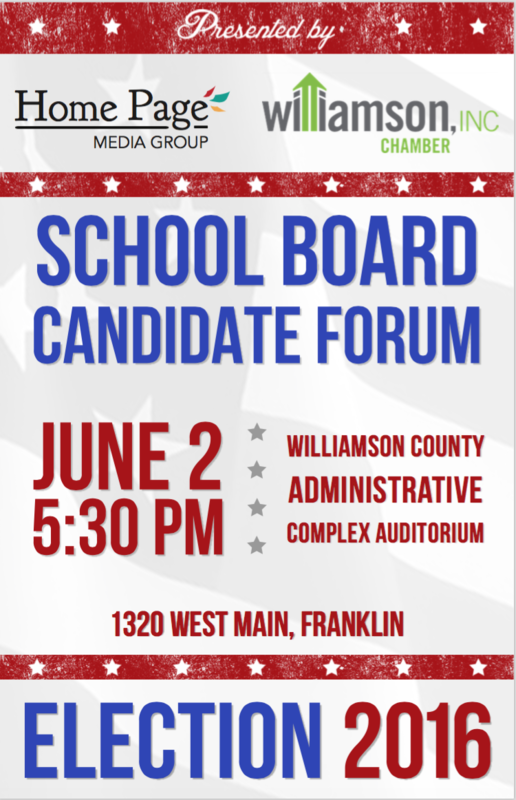 In partnership with Williamson, Inc., the Home Page Media Group will host a school board candidate forum at the end of next week with all 16 school board contenders. The event will be June 2 at 5:30 p.m. in the auditorium of the Williamson County Administrative Complex, located at 1320 West Main Street in Franklin. Questions will be on issues that relate to Williamson County Schools. Home Page Managing Editor Mark Cook will serve as moderator. Only the odd-numbered district seats are up for election on the Aug. 4 ballot in this year’s school election with the addition of the District Four unexpired term seat. Because of the amount of candidates, the Home Page will have each district’s candidates answer questions for roughly 25 minutes. Five minutes will be allowed in between for candidates to rotate. District One candidates – Angela Durham and Richard Davis – will start answering questions at 5:35 p.m.
District Three candidates – Christy Coleman, Kim Little and Eliot Mitchell – will start answering questions at 6:05 p.m.
District Four candidates – Joey Czarneski and Anne McGraw – will start answering questions at 6:35 p.m. McGraw will appear via Skype. District Five candidates – Gary Anderson and Julie Mauck – will start answering questions at 7 p.m.
District Seven candidates – Bobby Hullett, Jennifer Luteran and Christopher Richards – will start answering questions at 7:30 p.m.
District Nine candidates – Denise Boothby and Rick Wimberly – will start answering questions at 8:00 p.m.
District 11 candidates – KC Haugh and Stuart Cooper – will start answering questions at 8:30 p.m. The forum will be televised on Williamson County TV (Comcast Channel 3). For those who would like to submit a question for all candidates or their district, please email news@franklinhomepage.com.